President Muhammadu Buhari has called on the electorate in Osun State to vote for the governorship candidate of the All Progressives Congress in the state, Alhaji Gboyega Oyetola, in the election coming up on Saturday. 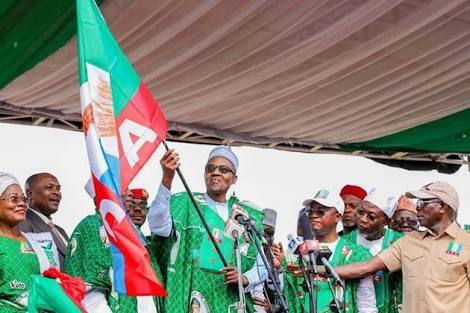 Buhari, who stormed the Osogbo City Stadium on Tuesday to solicit for votes for the APC candidate, urged the people of the state to support APC and not those who are "corrupt". The President lauded the administration of Governor Rauf Aregbesola which has been in power for the past eight years, saying his performance had given the party the reason to celebrate and to be hopeful that the party’s candidate in the poll would emerge victorious. Buhari described the governorship candidate of the party as the right man for the job while urging the electorate to vote Oyetola in order to continue with the development witnessed under the Aregbesola’s administration. Buhari said, “Today, we are here to celebrate the past. On Saturday, your love and friendliness are clear for us to see. Some years ago, I was here with so many of you to get support for Governor Aregbesola for a second term. I was in Osun in 2015 for the presidential campaign. I returned in October 2016 to commission Osogbo Government High School, one of the 11 mega schools constructed by Aregbesola. “We are here to thank the Almighty God for the successful eight years of APC government in this state under the leadership of Rauf Aregbesola. We are also here to pray Almighty God to save us and consolidate on this through Gboyega Oyetola. "You are feeling our Osun State partnership story. Oyetola is our partner, a trusted person, a brother and a friend to Governor Rauf. “For electing Oyetola as your governor, you have a team for consolidation of these successor’s eight years after Governor Aregbesola. The state has excellent infrastructures for primary and secondary schools. Oyetola is ready to work.